Edouard "Newsy" Lalonde knew his way around sticks, be they bent on ice or bent with a net. The hockey legend (scored for the Montreal Canadiens in the first NHL game ever) also managed to get himself named Canada's best lacrosse player of the first half of the 20th century. 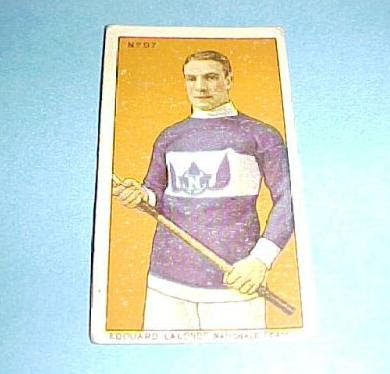 This circa 1910 Imperial Tobacco Co. LAX card - featuring the very stylish Montreal Nationale team sweater - is going for an eye popping $100,000 on Ebay. Some lucky hockey fanatic grabbed up his other ciggie card for that bargain price last year.